While the Southern Pacific would field an entire fleet of streamlined Daylight passenger trains only one, the Shasta Daylight, was a long distance train as the rest were regional runs serving several different California cities. The popularity of the Daylight was incredibly high, even through the early 1960s although by the latter half of that decade the SP began greatly reducing services and amenities on the fleet as patronage declined. Additionally, the railroad grew tired of fielding passenger trains altogether at that time. The Shasta was the Espee's farthest reaching northern train and offered incredible views of the Pacific coastline, northern California, and the Cascades to Portland. Today, much of the original Shasta route continues to be hosted by Amtrak through its Coast Starlight although the train has been extended much further north to Seattle. Much like the Pennsylvania Railroad was to the State of Pennsylvania so was the Southern Pacific to the State of California, an institutional icon. Also just like the Pennsy the Southern Pacific (also referred to affectionately as the “Espee” by railfans and historians after its SP reporting marks) has such a history that entire libraries of books could be written on the differing aspects of the railroad. 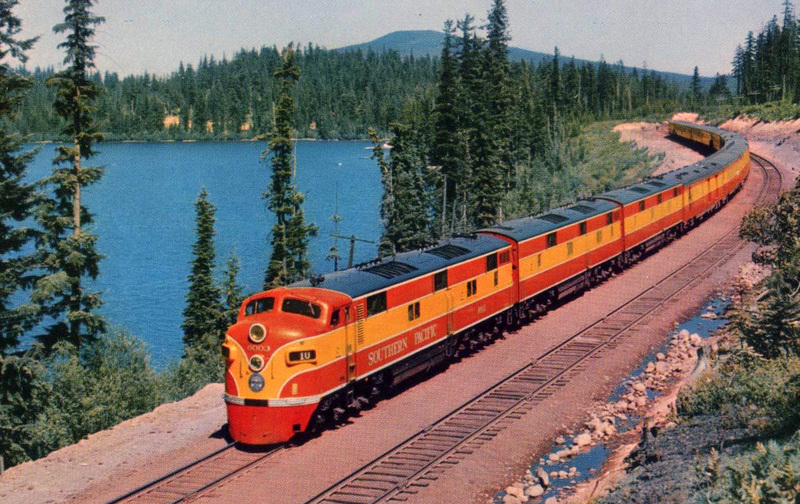 The SP was by far our country’s single largest classic railroad (i.e., before the modern-day merger movement began in the 1950s), spanning over 15,000 miles and reaching from the stretches of northwest Oregon to southeast Louisiana! The Southern Pacific has a whole host of renowned achievements it is credited with, far too many to go into detail here. However, to name a few it had three important main lines which continue as important arteries under Union Pacific today, the Overland Route (San Francisco to the Midwest via UP), the Golden State Route (the Southwest to Kansas City in conjunction with the Rock Island), and the Sunset Route (the Pacific Coast to the Gulf Coast). The Southern Pacific’s famed Daylight has its beginnings dating back to early 1937 when on March 21st it was inaugurated as an all-streamlined passenger train serving Los Angeles and San Francisco. Up front was a Golden State, 4-8-4 steam locomotive in SP’s GS-2 class in a streamlined look that would become legendary. The livery, which would also go down in history as one of the all-time classics, chosen for the train was designed by the railroad’s own Charles Eggleston of red, orange, and black. As it were, the Shasta in many ways was the embodiment of all that the Southern Pacific had to offer in the way of passenger services; unparalleled scenery, top-notch service, and on board amenities that couldn’t be beat. 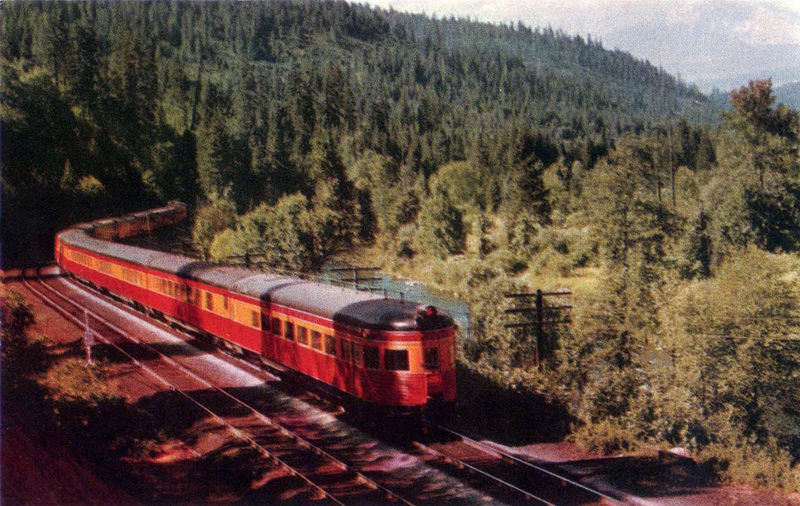 The Shasta hit the rails in the spring of 1949, twelve years after the SP had started its Daylight. In that amount of time the Daylight fleet was a national sensation and the SP soon realized that it had another hit with the Shasta. 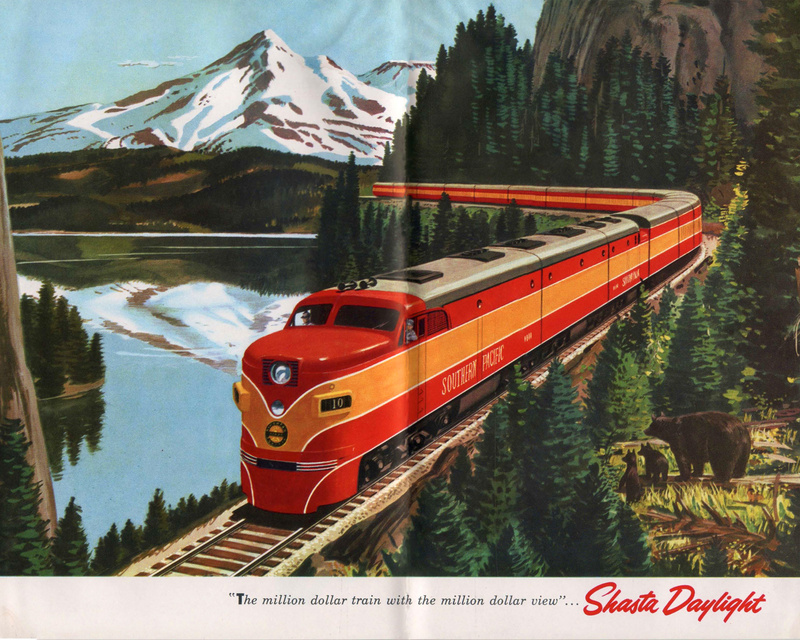 The train operated between Oakland/San Francisco and Portland, a distance of a little over 700 miles and just like the regional Daylights the Shasta featured spectacular scenery along its entire route. Also just like the original Daylights the Shasta was clad in the “Daylight” livery of red, orange, and black and hauled by either EMD E-series or Alco PA diesels (the PA is arguably the most beautiful diesel-electric ever built). Listed as Trains #9 and #10 on the Southern Pacific's official timetable the Shasta Daylight departed Portland, Oregon at 7:45 am heading south towards California. After a stop in Martinez, California to pick up/drop off passengers connecting to or from Los Angeles the train continued on to Oakland and arrive at San Francisco just after 11 pm the same day (if one continued on to Los Angeles they could expect to arrive there by later morning the following day). Along the way the train passed through beautiful northern California and then through the Cascades along the way passing locations like Mount Hood, Odell Lake, Crater Lake, and other spectacular features of the Pacific Northwest. What the made the trip even that much more memorable was the extra large windows built into the Pullman-Standard cars for maximum sightseeing and outdoor viewing. Overall the train could average about 46 mph during its trip and complete the journey in under 16 hours. Inside the train was no less spectacular. Featuring diners, lounges, and parlor-observations that were stylized for the local regions the train served, a trait that most certainly increased the train’s popularity. However, the Shasta's most striking feature was an articulated, two or three-car diner-tavern-lounge that offered open, unimpeded space between all three cars due to a new design feature from Pullman-Standard (whom the Southern Pacific purchased all of their passenger equipment from) which removed the bulkheads between cars and created an open walkway space between them to look as if all three were one. As with the rest of the Daylight fleet the Shasta was completely air-conditioned, still a rather uncommon accommodation when the train debuted in the late 1940s. The Daylight fleet remained very successful through the early 1960s but even the Southern Pacific with its vast array of popular and extravagant passenger trains just could not compete with the age of the automobile and super-fast jet airliner. 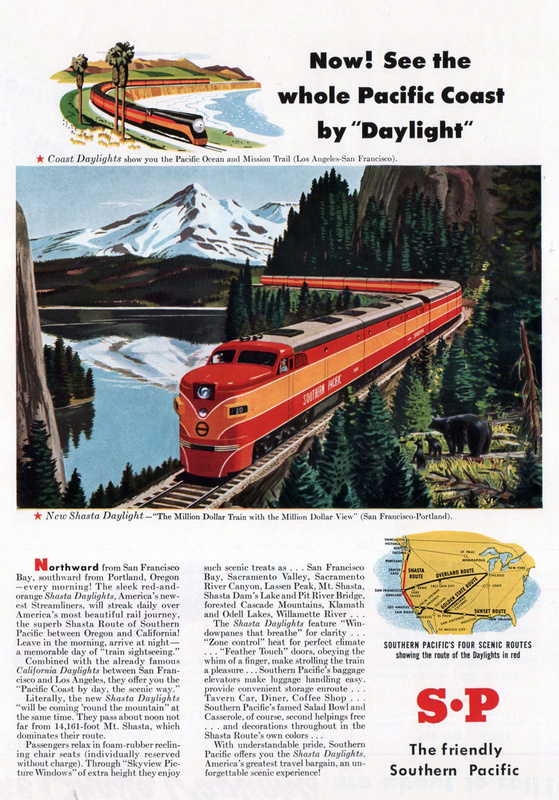 Most of the SP’s Daylight fleet had disappeared by the time of Amtrak in 1971, although its original, now named the Coast Daylight remained and was initially kept under Amtrak although was eventually terminated in favor of the Coast Starlight. This new train now operates over the Southern Pacific’s old tracks between LA and Portland, following virtually the same route as the Shasta Daylight and is today one of Amtrak’s most popular trains.